Today’s recipe comes courtesy of the Austin Junior League. The original recipe for “Chocolate Dulces” is in the cookbook Austin Entertains. I cut the recipe in half, used brown sugar instead of white, and used the microwave instead of a double boiler. These are so good! The only thing I might do differently the next time is add some (not too many) whole chocolate chips at the end (as opposed to just melting them all). But these are excellent — good cookies without a lot of work. 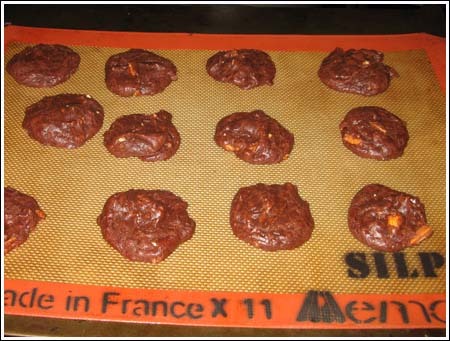 Preheat oven to 350 degrees F. Line two cookie sheets with parchment paper or Silpats. Place chocolate chips, brown sugar and butter in a 2 quart microwave-safe bowl. Microwave on high for 30 seconds. Stir to disperse heat, then microwave again for another 30 seconds. Stir until mixture is melted and smooth. Place bowl on scale and pour in 7 ounces of condensed milk. Alternatively, you may forego the scale and eyeball half a can. Add flour and stir until incorporated. Stir in vanilla and toasted pecans. Drop dough by rounded teaspoonfuls onto prepared cookie sheets. Bake each sheet for 10 minutes. Cool on cookie sheet for 3 minutes, then transfer to wire rack to cool. I use a digital scale so that I can be precise with my condensed milk measurement. Condensed milk is kind of tricky to eyeball. To toast the pecans, I spread them on a paper towel and microwave them for 2 to 2 ½ minutes. If you’d prefer to do it the old fashioned way, just spread the nuts on a cookie sheet and toast for 8 minutes or until fragrant. You’ll want your nuts to be cool and crisp before you add them to the batter, so toast them first. Saw you on the Pillsbury bake-off show where you mentioned your cookie blog. I just finished a batch of these and they are fantastic. I used a four ounce bar of bittersweet and two ounces of semi-sweet chips. Love the blog and will be back! These would be great with hazelnuts. I think another alternative would be to just leave the nuts out and use extra chips. The cookies are pretty fudgy — slightly chewy, but soft and dense. The nuts taste great, but again, you could leave them out. Have you ever tried these with different nuts? I’m allergic to tree nuts and would like to try these with hazelnuts instead. Thanks.